Today, I am not at our retreat. Today, I will brew coffee, catch up on the news, jump in the shower, wake the kids, brush little girl's hair, make the bed, load the crockpot, fix school lunches, shoo kids out the door, empty the dishwasher, take the dog to the park, peel apples and bake a pie, sweep the floor, wash and fold a few loads of laundry, dial some work calls, vacuum the carpets, take out the trash, scrub a toilet or two, check on the ancestors, send a birthday card, descend on the supermarket, visit the dry cleaner, scarf down some lunch, sneak in some Christmas shopping, gas up the car, nag the phone company, drive carpool, drag a kid to the doctor, patronize a second grocer, buy and wrap a party gift, help with homework, cook and serve dinner, clean up the kitchen, pack for the weekend, hit the gym. And whatever else I forgot. Hopefully find some time to write. If I'm very lucky, to read. Tomorrow, I'll be at our retreat. I will eat, and sleep, and read, and write. And write, and write, and write. I once was a big fan of the television show What Not to Wear, where people and a hearty sampling of their pitiful wardrobes are whisked away to NYC for a complete overhaul by Stacy and Clinton. I found it hard not to cringe, though, when those featured were criticized--at times mercilessly--for simply expressing their individuality through their fashion choices. In the end, I suppose, maybe their egos recovered when they got to take home a brand new wardrobe of the 'right' clothes. Never wear white after Labor Day or before Easter. Don't wear horizontal stripes; they'll make you look fat. Never wear orange if you're a redhead. And yet today, I wear whatever I want, whenever I want. As I'm typing this, I have on a plaid shirt and a plaid scarf--not the same fabric or really the same colors but it works, I think. One of my favorite shirts has horizontal stripes, and I've been a redhead and worn orange and pink and red without a second thought. Plus I'll wear white any month of the year--as long as it's clean. My point is: I know the 'rules' of fashion and yet I'm not shy about breaking them if I think I can pull it off. Joan and I recently took a class in Austin, and I found it interesting, that as the instructor rattled off some 'rules,' she countered nearly every one with an exception: an author who didn't follow convention yet found success anyway. I realized that ever since I started pursuing writing as a career, I'd read and heard a lot of advice about What Not to Write. Don't write more than 100,000 words for your first novel. Don't follow the latest trend--vampires, werewolves, zombies, etc. Don't start a book with a reference to the weather. Don't 'head-hop' or have one scene with multiple POVs or have too many POVs in one story. Don't start or end a book with dialog. Don't tell an agent that you're writing a trilogy unless you've already sold the first one. So, if every author followed The Ever-expanding Rules of Writing, Kathryn Stockett's first novel, The Help, which is over 150,000 words, would likely have been a much different--less compelling and shorter--story. Many folks have hitched their keyboard to the paranormal wagon and found new ways to spin a good ol' vampire tale and done quite well. As far as books starting with the weather, read the opening lines of The English Patient or The Memory Keeper's Daughter. I'm pretty sure he never 'head-hopped' but Carl Hiassen's Skinny Dip had so many POVs, I lost track. And loved the book so much, I've read it twice. I've also heard, "Don't write a book as though it's a journal or a diary." What about The Color Purple? And that "People don't read/like/want prologues or epilogues." Really? I didn't hear anyone complaining much about The Time Traveler's Wife or The Dive from Clausen's Pier. Someone also advised me to not write in the present tense. As in A Heartbreaking Work of Staggering Genius? And two other books I loved: Open, Andre Agassi's autobiography and Elizabeth Berg's Until the Real Thing Comes Along. So, my advice to anyone who writes is this: Study the craft, learn the rules and then write what moves you. It's fine to wear white in winter while you write your vampire novel in multiple POVs in present tense with the opening scene taking place in a violent snowstorm. Just do it well--wear it with confidence--and I'm sure you can pull it off. What Women Write is on hiatus today and Friday in observance of the Thanksgiving Holiday weekend. We will resume our regular posting schedule on Monday, November 28th. We wish all our US readers a Happy Thanksgiving! 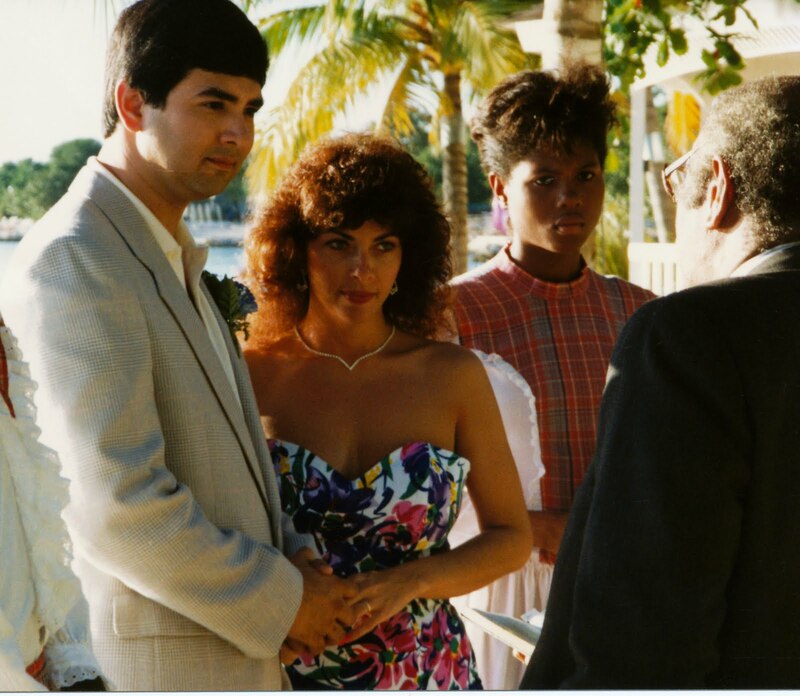 As luck would have it, today’s the 21st of November and 21 years ago on a beach in sunny Jamaica, I married my face card (no, not the joker, though he does make me laugh!). This past weekend, we celebrated our anniversary at a beautiful B&B, The Inn on Lake Granbury, recommended by both Susan and Elizabeth. It was a lovely respite, a private house to hole up in with the lake glistening under an autumn sun. Late afternoon Saturday, we watched from a hammock as another bride and groom vowed to start their own journey. What I would tell them is this: Marriage takes nurturing. It takes love and work and humor and honesty and tears and more love. A manuscript takes nurturing as well. I have worked and loved my manuscript. I have cried and laughed over it. I’ve had to face some honest truths about it, too. As much as I nurture my story, I know it takes more than that to find the right agent and then the right publisher. It takes a little luck. My husband is a detail kinda guy. He's an engineer, after all. He likes order, and process, and structure. With that said, I realized early in our relationship that he's an all-or-nothing man. He's loyal to his friends for a lifetime, he's a boss's dream employee. As a spouse, he's a fantastic home chef, he loves his children without reservation, and it's fun to watch him dive into a new project--whether that means a 24-hour mountain bike race (he just completed 24 Hours of Moab in October) or planting a garden so we have fresh vegetables and chilies. Halloween was no exception. For the past several years, he's been out of town for work when trick-or-treating comes around. This year, he decided to use his God-given size and fantastic square head to create the perfect monster. After a trip to Goodwill for the too-small coat and two hours of makeup, he became Frankenstein--the scariest our neighborhood had ever seen. It wasn't just the makeup or the clothes. He was in-character, lurking behind trees, straight-arming little girls who came too close. He practiced his walk before the sun set, to make sure he had just the right creep factor. ("I don't want to appear too zombie. Am I walking too zombie?" he asked.) All or nothing. It's the only way to go, for him. It made me revisit some of my own characters in my current manuscript. Which one would go all out on Halloween? Would my protagonist organize her research papers, or scatter them wildly? Did I know the motivation for each character? I wasn't sure I knew the answers to those questions. Do I know my own characters as well as I know my husband? I decided that if I didn't, I'd better get to know them, and quickly. Because with the characters we create, it's all or nothing, too. With my newly-found critical eye, I've also spent some time reading a fellow writer's latest manuscript, and I've turned the microscope on her characters as well. By page fifty, I wasn't sure if I knew any quirky traits of the main players. Even if two characters have the same profession, they don't have the same personalities. Which one is the life of the party, who is the wallflower? What traits set them apart? If you don't know your characters inside and out, sometimes they get unruly and you're not sure why. It might be because you don't know them well enough. 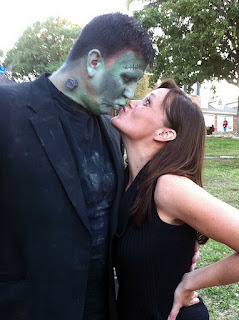 It didn't surprise me that my husband decided to Frankenstein-up his holiday. And I couldn't imagine him doing it any other way than exactly how he did it. (What other man would spend two hours on makeup?) I knew it because he's my spouse. And the only way to know our characters is to view them the same way. Trying to write. Trying to write. Writing, writing, trying to write. My plan was to have the first draft of my WIP complete by our annual retreat. That's coming up soon, and I have been making progress, and I might even yet make the goal. Trying to write. Trying to write. Trying to find time to write. But life has slammed me with circumstances that add more than the usual wife/mother/part-time employee stress to my life, and finding time to write is tough right now. How to balance the things that must be done, the things that should be done, and find time to write? Which really, should fall into that first category, shouldn't it? Must be done. Trying to write. Trying to write. Finding time to write. Finding more and more in the writing. The good news about this weird situation is that the story is unfolding in ways I hadn't expected, those famous oniony layers peeling away, and some characters that I thought mattered shedding right along with them. (Like the brown skin on the outside, trashed.) The story is enriching, developing, twisting and turning and hopefully in ways much less cliched than this sentence. Characters are dancing together, names are changing, people in the story are rising to the front and demanding to take their rightful part. This is a good thing. But. Finding time to write. Finding time to write. I might get it done. I might not. Either way, I am going to be okay with this, because if it's not done on December 1, by December 4 it will be much further along. This is still a self-imposed deadline, and if I don't make it, I haven't failed. I've just worked with what I've got right now, and I don't want to rush to the next draft, the one that is much closer to the one that will hopefully land me an agent and a book deal. I just need to try to write. Find time to write. Keep on writing! And get a little sleep. How did you spend 11-11-11? About a month ago, an email appeared in my inbox from A Real Bookstore announcing a special event they were hosting on November 11: An Evening with Stephen King. I've been fortunate to see some amazing authors, but this one ... well, let's just say, I didn't see this opportunity presenting itself for me again anytime in the near future. Normally I'd have forwarded the email to my fellow bloggers first, but I figured my husband would want to go so I called him instead. Yes, he was on board. So, I purchased our tickets and eagerly awaited the date. When we took our seats in the sold-out auditorium, we were kept entertained by trivia questions that played on the screen over the stage. "What book was inspired by Stephen King's run-in with a Saint Bernard?" Easy. Cujo. "What event inspired the book Pet Sematary?" Stephen King's daughter's cat getting run over on the highway. And so it went until he appeared on stage and commandeered the microphone, stepping from behind the lectern and ignoring the stool provided for him. My first impression was how small he appeared to be. I guess anyone larger-than-life appears remarkably normal when you finally see him in person, and we were pretty far back so his 6'4" frame seemed non-imposing. My second impression was how funny he was. Immediately engaging, he had the audience laughing much of the time--not at all the dark and brooding persona one might imagine given the stories the man creates. He talked a lot about his early writing career--from his first autograph (while in the john, given to the restroom attendant) to his first time being recognized in public. He said he's often asked what scares him. "Everything," he said. "Spiders, snakes, the elevator in my hotel, standing up here talking to a large crowd." Apparently, most writers--even notorious ones--share this fear. Before answering questions from the audience, he read a few pages from his new book: 11/22/63, a "what-if" tale of time travel and Kennedy's assassination. His research for the book brought him to Dallas and he returned for a benefit event the night before for the Sixth Floor Museum. In doing research for the book, he said he watched a lot of old tourism movies from the Dallas Public Library to get a feel for the setting of that era--what people wore and drove, the look of the town. When asked if he thought it was harder or easier today for new writers to make a name for themselves as authors, Mr. King said that he thought it was easier today given all the different venues one has available through ebooks and self-publishing. But he thought people put too much emphasis on getting published. "You have to get words on paper, words on paper, words on paper--then worry about the business side of it." When asked if he would ever consider writing for young adults, he said, "Well, I write for the whole family!" When asked which of his book-to-screen projects he was most proud of, he listed: Stand by Me, Storm of the Century, and Shawshank Redemption. There's a "beautiful hypnosis that takes affect" when you get immersed while writing a book. While writing, "characters do things that surprise you and that's the greatest thing of all." "The worst day I had in that chair (while writing) was absolutely terrific." When starting a new book, "you have that feeling of total inadequacy." What surprised me the most was that after all his successes and for all his fame and fortune, he's really just a writer, worried about the next book and doing his best to make sure he tells one amazing story after another. Lucky for us, he still seems to have a lot of ideas. And after penning over 50 novels, that's inspiring! Back in 2009 Pamela, Julie, Elizabeth and Susan all blogged about NaNoWriMo (short for National Novel Writing Month). Elizabeth committed to the full 50,000 words and she did it. The others (including Joan, who did not publicly weigh in) all had ambitious private goals and all made great progress. I was the lone hold-out. I’d written a novel in three months before so, despite evidence to the contrary, I can produce words quickly. In fact, it took me ten minutes to compose a 525 word excuse about why NaNo was NaNot for me. I read it over again this morning, and much of it still applies. Here are the highlights, adjusted for 2011 circumstances. One: I would kill myself writing 50,000 words in a month only to spend the next year rewriting 49,000 of them. Twice. I’d have plenty of time to do it because my family would no longer speak to me. Two: According to NaNo rules, you are supposed to work on an entirely new project. I would rather hack off my own arm than abandon a novel within 10,000 words of typing The End. Three: My office remains just as it was in 2009. Click here and feel my pain. Four: My family members expect to eat and have clean clothes to wear. Five: NaNo works great for writers who compose first and edit later. I write like a painter paints – in layers. Start with a sketch, add a wash or two, build up details here and there, etc. If the composition as a whole doesn’t work, I don’t want to waste my time crafting scenes that I’ll have to murder later. Six: My protagonists are both artists, so composing like a painter makes sense. Seven: The Oak Lovers is mainly a true story. Research is on-going and I have no control over when new details will fall in my lap. Sometimes that information changes a dynamic of the story, making revisions necessary before I move on. Eight: I don’t want my two children asking why I spend more time with my dead great-grandparents than with them. Nine: Who picked November? Thanksgiving break! Nutcracker rehearsals and performances! Visiting relatives! Teacher conferences and school programs! What is NOT happening this month? Ten: Composing requires me to disengage from my life and take up temporary residence in 1920. I’ll tweak dialogue while driving Ashlyn to school or compose one of Carl Ahrens' clever insults while listening to Sasha talk about her day. Something as benign as a phone ringing can shatter my focus. My family all know I’m not “entirely here” when I’m working. It’s mentally exhausting to live trapped between centuries. If I spent a month moving directly from one chapter to another without emotionally decompressing, the men in white coats would come to cart me away by the end. I have nothing but respect for all the writers who have committed to NaNo. I’m thrilled for the participants who post updates on the Writer Unboxed forum on Facebook. I read your posts, I cheer you on, and then tap into your creative energy to plod along on my own manuscript. My word count at the end of the day might be one zero less than the 2500 or so average I see others composing, but it is still forward progress. I am content. How about you? Are you participating in NaNo or have you in the past? We’d love to hear your experiences. Some might call it "disconnected." Some might call it being "unplugged." Whatever you call it, it's what I've been for several weeks. It's been a good, but busy time. I went on a long weekend retreat to Oregon. I've taken one child on a college visit (thumbs up!). 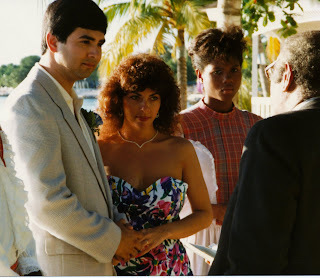 I married another child off (thumbs up, again!). I've had seven relatives in the house for the better part of a week (thumbs up, of course! ), including one super cute 18 month old who keeps us entertained and busy! In the midst of all this, my laptop computer's wireless card died a final, irreparable death after being finicky as a cat with nine lives for two years. My hand-me-down iPhone 3G has slowed to a painful crawl, nearly audibly begging to be replaced with a snazzy 4GS (even if I'm still pouting the new iteration isn't a 5--I held out so long!). It's been nice feeling a little more grounded in the "real world." Especially in the last week, my family probably appreciated me being more "in the moment" than I am when I can beam myself up to my virtual communities in seconds. But I'm ready to get back to work. Next week, I'll purchase a new laptop and upgrade my phone. I'm ready to get my hands (with an annoying pre-wedding manicure I can't wait to lose!) on a shiny new computer keyboard and get started on the notes my editor will soon deliver for revisions to Calling Me Home. I'm ready to re-engage in conversation with my writing colleagues, my critique partners, my potential readers. I'm ready to start making detailed notes about the new story brewing in my head. I'll enjoy these next few days before family is all gone home--a first visit to the zoo for my precious niece is on the schedule for tomorrow--and I'll miss them all terribly as I always do. But it's good to have a job I can do almost any time and anywhere. It's good to enjoy it so much I begin to feel a little antsy when I'm away too long. It's good to have "co-workers" I can't wait to talk to again. 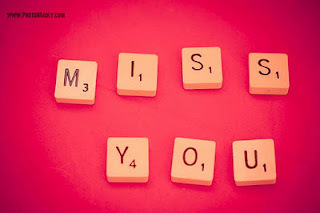 It's good to be in a career that makes me feel so "me" I miss it when I'm gone. What do you miss about your job or your passion when you unplug for a time? “We need a workshop!” Pamela and I agreed. (Goofy opening dialogue explained later!) We both knew that we could benefit from an intense day on craft. On Saturday, we attended the Writers’ League of Texas’ program, “The 1-Day MFA: Lessons in Voice, Character, & Dialogue,” with instructor Sara Kocek. While it’s hard to get too deep in one day, Sara offered plenty of solid advice for us to apply to our current manuscripts. “Where’ve you been?” He didn’t look at her. He heard her twisting the corkscrew, grunting. “Red, it is,” she said. He finally looked up. She sipped too long on her glass, squeezing the bridge of her nose. “Hey, it’s okay,” he said. “No, it isn’t.” Her voice shook. Okay, it’s not perfect, but you get the idea. Next Sara offered tips on writing strong characters. Supplying your protagonist with a driving desire is key—what does she want more than anything and what stands in her way? But that’s just the beginning. To make things more interesting, give your character contradicting traits or beliefs. Better still, give her a secret—if revealed, this secret would change the character’s standing in the world. For example, it would be a bad day for my character Janey if anyone found out that she, a respected art conservator, had a wardrobe of confiscated antiques at home. Voice is an area I struggle with. I’ve had a particular challenge in my current manuscript because I’ve got to get right not only the Italian and Irish immigrants in Victorian London, but also two present-day architects who share the same background. Luckily, one embraces his Italian and Jewish heritages by interspersing ethnic phrases in his speech. The other is a lonely widower with a happy-go-lucky Springer Spaniel. Sara’s main advice was to make sure your character’s voice sounds authentic. We also learned the elements of plot and structure, how to weave in sub-plot, how to write strong beginnings and endings (and how NOT to!) Don’t start your book with the weather. Don’t place your readers into an otherwise normal day in the life of your character. Better to drop them into a riveting scene where they grab onto the coattails of your character and don’t let go. As for endings, trust your readers' intelligence—resist the urge to draw conclusions. Avoid the soap opera trap (unless you’re Jane Austen). And don’t begin or end your book with a quote (unless you’re Margaret Mitchell). 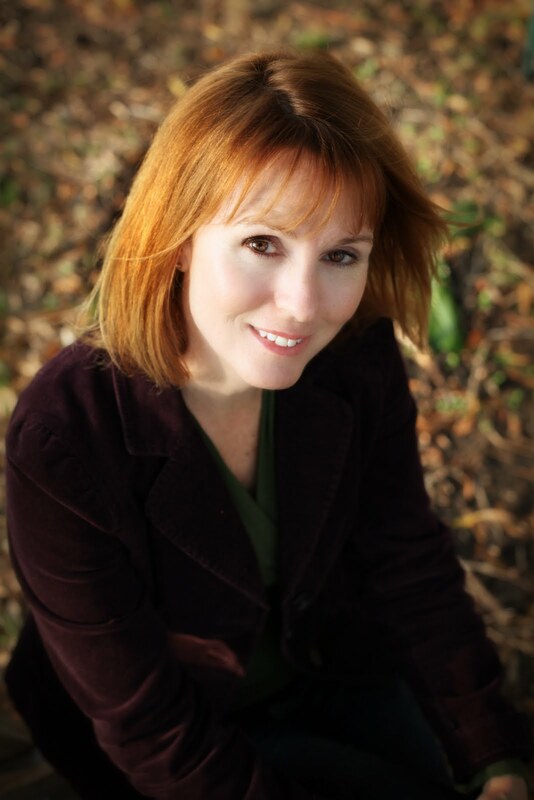 If you’re in the Austin area, Sara Kocek is offering a second WLT workshop. Sign up here. Sometimes you find a book that captures you. You can't put it down. Even though it's dark, and sometimes painful, and beautifully sad, you keep turning pages. 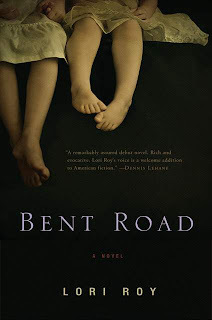 When I found BENT ROAD by Lori Roy, I stumbled into a world of collective pain and family drama. At the same time, I found hope. It was one of those books that moved me enough to contact the author. Here is our conversation. WWW: After completing BENT ROAD, I immediately emailed my gals here at What Women Write, encouraging them to pick up a copy. However, I had a hard time naming the genre. I called it 'Literary Gothic.' What would you call it? As you set out to tell this story, did you always see the Gothic elements in place, or did they write their way into the story? LR:First and foremost, many thanks for recommending BENT ROAD to your friends. Word-of-mouth is crucial for any author, and most especially for us new authors. BENT ROAD has been tossed into many categories, but the one consistent descriptor has been literary fiction. I am compelled by and most interested in my characters, something that lends to the book’s literary qualities. However, I also believe strongly that putting characters in action is the best way to define them and root them in a reader’s mind. It’s the old “show don’t tell” adage. I am particularly interested in those moments in a character’s life where she is unusually stressed. It’s these moments that I believe most reveal a character, not only to the reader but also to herself. As a reader, I like a little suspense to compel me to turn the page. I worked very hard to provide this to the readers of BENT ROAD. I wanted to fashion a plot that would make them desperate to turn to the next page. As to the Gothic elements, they rose up out of a gritty setting and family secrets that had been simmering for many years. If I were to place BENT ROAD in a category, I would probably call it literary suspense. WWW: In preparing for our conversation, I stumbled across your query letter, published by your agent, Jenny Bent, on her blog. Without asking you about your query letter format (which was interesting in itself) I’m more interested in your mention of your organization of your agent hunt. How did your background in tax prepare you for the craft of fiction, and what was your process for writing BENT ROAD? LR: I don’t know that my tax work prepared me for the craft of writing, but it certainly prepared me for the associated research and provided me the tools to organize that research. I did a good deal of technical writing in my accounting days and I would say that experience served me well when I began looking for an agent. Query letters are professional communications and should be treated as such. I think that’s an important thing for aspiring writers to remember. The long hours I worked when I was a tax accountant also prepared me for planting myself in a chair and staying there until the writing is done. As to the process of writing BENT ROAD, I would like to say I had it carefully outlined and knew every twist and turn well before it came along, but that would not be true. 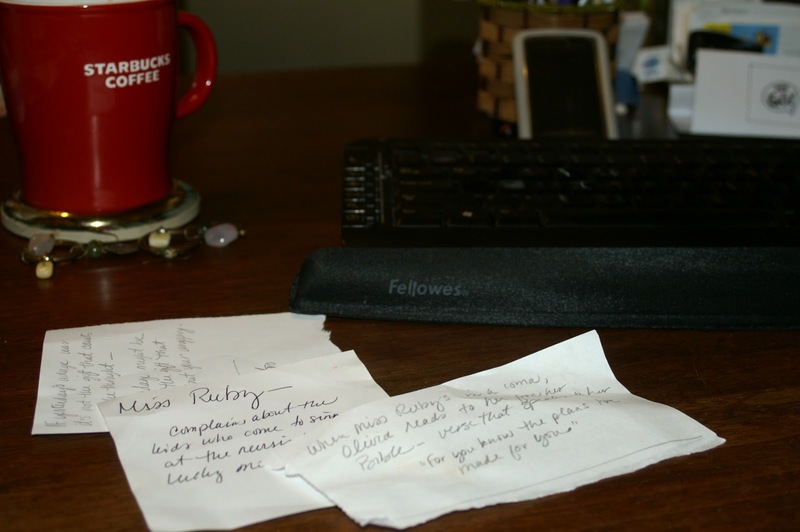 While my tax accountant life was quite orderly, my writing life is not. About the only order to my writing life is that I insist on strict word counts every day. Beyond that, I struggle with countless rewrites as I try to unearth what really happened to these characters of mine. WWW: Let’s talk a little about BENT ROAD itself. What was the moment of genesis for you in creating the story of the Scott family? Was there a specific reason you chose Kansas in 1967 as your setting? LR: I have found that all my stories begin with setting. I have also found myself most interested in settings that pose obstacles or are threatening in some way. Western Kansas can be a beautiful place but also a foreboding place, particularly to a group of newcomers. BENT ROAD grew out of a short story in which a family flees Detroit to move back to Kansas. I chose the late 60s because I am drawn to a time when technology was less of a distraction and people seemed a bit more accountable to reality. WWW: You begin BENT ROAD with Celia driving the family from Detroit to Kansas, with her husband, Arthur, ahead in another vehicle. What was your primary goal in the opening scene? Did you struggle with creating the perfect opening hook? LR: The opening scene of BENT ROAD was always the opening scene. I like the idea of beginning a story in the middle of something, dropping the reader directly into a character’s life. I think we’ve all experienced the stress of trying to follow someone in a car, and using such a universal experience allows a reader to quickly relate to the character. At least, that is my hope. WWW: Part of my fascination and love of this story was your use of point of view. Can you give our readers some insight into writing each section from a different POV— sometimes even telling the same scene from the other side of the room? How easy, or difficult, was the balance of point of view in the story for you? LR: The use of multiple POVs was a balancing act and something I struggled with during rewrite. I am drawn to using multiple POVs, primarily because as characters pop up, I find myself suddenly interested in unearthing their stories. It’s always important for a writer to consider which character is most impacted by a particular event. This is generally the POV that should be used when telling the event. I came across a few scenes that I felt were worthy of a look from multiple characters. I do limit myself in the number of POVs I’ll use, as I think too many will dilute a story. WWW: As a writer, do you follow a structured path to the conclusion, or are you surprised by where the characters take you? Or is it a combination of both? LR: I wish I followed a structured path and I have tried various methods, but in the end, my characters tell the story. Sometimes it takes me a while to figure out what happened, but eventually the plot bubbles up. I do much flushing out during rewrites. WWW: Your post on Bent On Books about securing Jenny Bent almost made me cry. (Especially when you answered your daughter’s question regarding your own tears with “It’s Marilyn Stasio. It’s the New York Times.”) Tell us a little bit about your personal journey that brought your from writer to author. LR: For me, the most important part of making my way from writer to author was to keep writing without regard to all the statistics. If a writer spends any time at all considering how difficult the path is, she’ll likely quit. I once heard a young tennis player being interviewed. He had just beaten Andy Roddick in a match. Not a person in the tennis world would have thought this young player could win. The young man didn’t believe he had a chance, either, he said in this interview. But he kept trying. Even though he didn’t believe, he kept trying. Good advice to any writer. WWW: Here at What Women Write, we discovered that falling in step together as a community of writers helped hold us accountable to our own writing goals. What did you find kept you on track to meet your writing, editing, and revision goals? LR: I do have a few writer friends who have been very important to my development as a writer. Most importantly, they tell me when something is not working and when I can do better. Hopefully I do the same for them. I’m a firm believer that a crucial part of developing as a writer is reading and critiquing the work of other writers. As we become more skilled at analyzing and critiquing the work of other writers, we become more skilled at analyzing and critiquing our own work. WWW: What are you writing now? Can you share with us? LR: I'm working on, and hopefully nearing the end of, a story about three women living on the same block just outside downtown Detroit. Set in the late fifties, during a time of escalating tensions, this is another book I would label literary suspense. 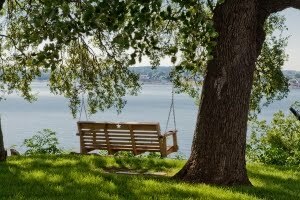 WWW: Let’s time travel: If you had one piece of advice to give a younger version of yourself at the beginning of your writing journey, what would it be? Would you change anything? LR: This is a tough question. There were certainly difficult times along the way. Like every writer, I occasionally wondered if I were wasting my time and struggled to ignore the statistics that tell us how difficult it is to publish a book. However, if I could, I would not reassure my younger self that I could overcome those obstacles. I think the struggle is necessary. Perhaps I find this question difficult because I had such great teachers along the way and I had the good sense to listen to them. These teachers gave me the advice and direction I needed when I needed it. Even my toughest days led me somewhere worthwhile, so I’d have to say I wouldn’t change a thing. WWW: I promise, Lori, that this was no waste of time. I look forward to your next novel! Because I write, you might notice something different about me. Okay, maybe in your head ‘different’ is ‘strange’ and I’m really fine with that. Because I write, friends have admitted to being reluctant to send me: emails, text messages and Christmas cards—fearing they might not spell something correctly. I assure them that I have the same worries too—regardless of who is reading it. Because I write, at times the temptation to correct others is nearly overwhelming. Lay/lie, who/that, was/were—it all makes me a bit crazy. While I’ve yet to actually do it, I did avoid Walgreens for over a month after the guy at the register told me ‘no problem’ when I said ‘thank you’ and then proceeded to say ‘have a good one’ as I left. Grrr … not poor grammar, really, but just two peeves of mine. (Two peeves of a snob.) I also looked around for the manager—again, same Walgreens—when I noticed their ‘stationery’ area was labeled as ‘stationary.’ Sure, it wasn’t moving, but I don’t think that’s what they meant. Because I write, reading for pleasure isn’t as pleasurable as it was ten years ago. I used to read anything and everything, but now—knowing what I do about the craft—I find I’m less tolerant of so-so writing. Because I write, I notice what makes you unique—the inflection in your voice, the way you tuck your hair behind your ear when you're nervous, how you kneel down to talk to a toddler, the wrinkles around your mouth that give away your smoking habit, the stains on your shoes, the way you talk to sales clerks and waitresses. Everything about you is fodder for one of my characters. I notice. Because I write, I scribble notes on everything. Please don't touch them, add to them or, for your own safety, throw them away. Because I write, I’m also insecure about what I’ve written. So, if you ever read an article, blog post or story by me, your telling me that you liked it means a lot. Really, I’ve only met a few writers with egos, so if you enjoy something an author has written, he or she would likely love to hear your nice comments. Find them on Facebook, write a nice review on Amazon, pass along a recommendation to a friend, or find some other way to pat them on their insecure backs. Because I write, I—and Julie and Susan and Joan and Kim and Elizabeth—support other writers by: attending author events, buying their books new and not used (so they’ll get royalties) and promoting their efforts here on the blog. Because I write, the world probably doesn’t look the same to me as it does to you. And if you’re an engineer (or a professional organizer or an artist or a nurse), I’m sure you see my world from a totally different perspective, and I think that’s pretty cool. Because, when I write, some days I am a professional organizer, an artist, a nurse—or at least I attempt to bring those characters to life in my stories. And that is way cool.